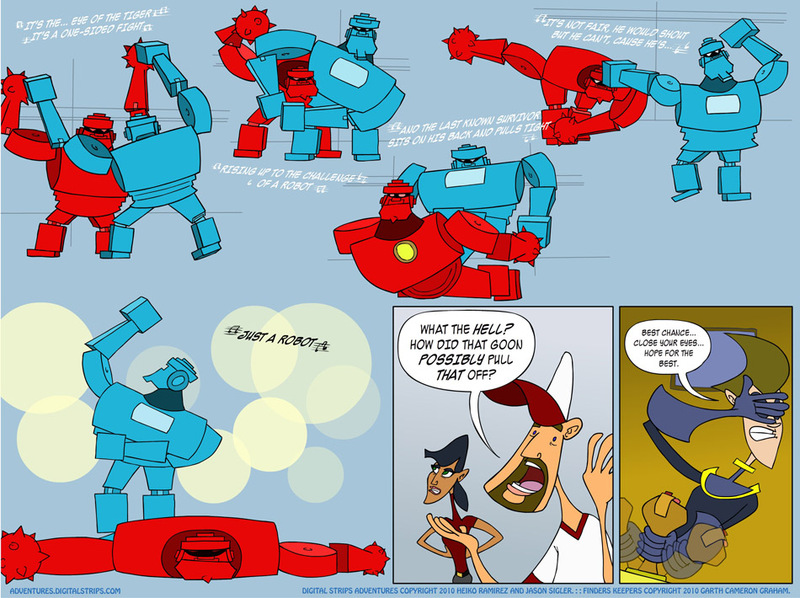 After 60-some-odd comics, finally, FINALLY, Heiko relents and I’m able to do the robot vs. robot, Eye of the Tiger parody that I pitched when we started this crazy thing! And you can be sure that next time I pit one robot against another, the fight will be much fairer. In this case, however, it seemed only right to help Midnight overcome the odds and achieve victory above his underdog status. Fight scenes are so much easier to do on my end, because I don’t have to consult with my collaborator, who is so busy with real life tasks and demands that he can’t check in to see if I’m following the script. Next arc? NOTHING BUT ACTION SCENES.